During the months of May and October--as well as throughout the rest of the year--the Church advises that we perform simple acts of piety to increase our devotion to the Blessed Mother. One great way to do this: pray the Rosary. This short booklet features meditations by St. Josemaria Escriva on the twenty mysteries of the Rosary. 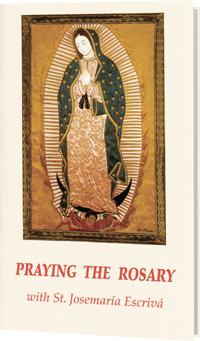 It is a great resource for teaching others to pray the Rosary in private, as a family, in a small group, or as a parish. An illustration for each Mystery.